For a night dedicated to a character who carried a wand, the Spokane Indians found little magic Friday in a 7-2 loss to the Tri-City Dust Devils at Avista Stadium. 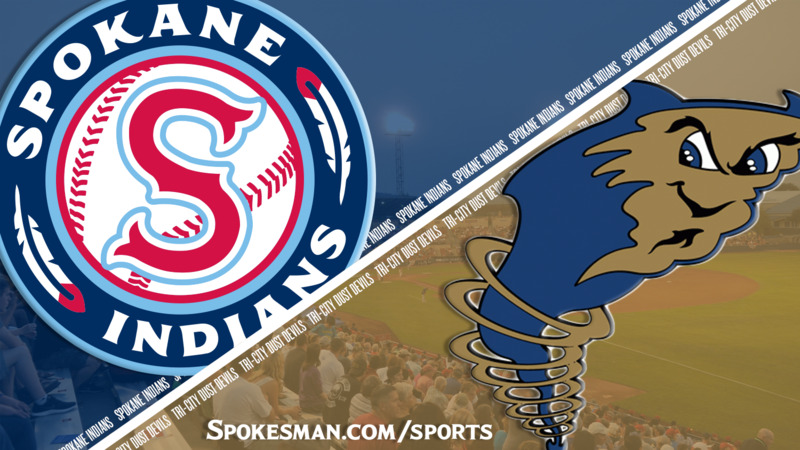 Spokane guaranteed itself a series win by taking the first two games of the series, but in the finale managed just three hits while its starter, Seth Nordlin, had one uncharacteristically rocky inning in an otherwise steady outing. Tri-City starter Sam Keating had a strong outing, working 5 1/3 innings to earn his second win in four decisions. He allowed two base hits, the first a bunt single in the third and a clean single in the sixth. For Spokane, there were more positive than negatives to the game. “We won a few series at home and now we get to get on a bus, head to Vancouver (Saturday) and do it all over again,” Holmberg said. Spokane pitching coach Jono Armold said he looks forward to how his young pitchers react to the challenge of playing a game after a long bus ride. Nordlin surrendered a run in the first inning after Luke Becker and Owen Miller hit back-to-back singles and Blake Hunt slapped a single under the glove of a diving Tyler Depreta-Johnson at third base. Spokane evened the score with a run in the third. Catcher Scott Kapers was hit by a pitch and trotted to second when Keating threw wide of the base on a pick-off attempt. Depreta-Johnson followed with a walk and J.P. Martinez laid down an exquisite bunt that loaded the bases with no outs. Diosbel Arias hit a sacrifice fly to center field to score Kapers, but Curtis Terry followed by grounding into an inning-ending double play. Then the bottom fell out for an inning. Hunt led off the fourth with a double off the wall in right-center and Nordlin walked Justin Paulsen. Olivier Basabe reached on an error by Spokane second baseman Cristian Inoa to load the bases with no outs. Nordlin walked Mason House for the go-ahead run and hit Tre Carter to force in the second run of the inning. Grant Little scored a third with a sacrifice fly, and Nordlin allowed the fourth to score on a wild pitch before giving up an RBI single to Becker for the fifth run of the inning. Sean Chandler came on to get two outs and end the inning. Nordlin worked 3 1/3 innings in the start, allowing six runs, five of them earned, and walking three. The Indians used five pitchers, scattering 11 hits, only one for extra bases, while striking out 12 Dust Devils on Harry Potter night. Published: July 6, 2018, 10:34 p.m.